British archeologist and military officer T.E. 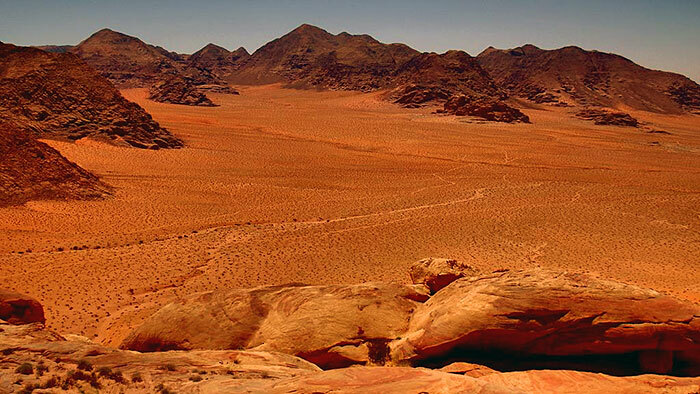 Lawrence, better known as Lawrence of Arabia once described the Wadi Rum desert as “vast, echoing and God-like.” Miles of red sand, majestic granite mountains and exquisite dunes, beckon visitors to this rugged, unspoiled expanse. 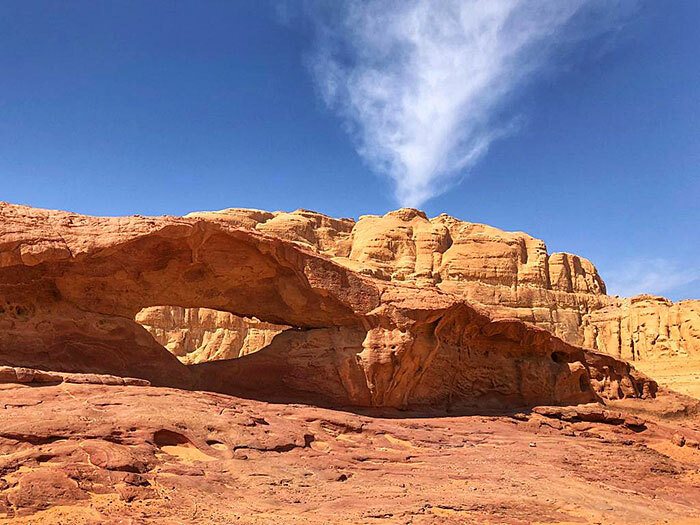 Also called the “Valley of the Moon,” Wadi Rum is Jordan’s largest valley and a protected area, yet Hollywood has claimed this lunar landscape as the perfect set for the films The Martian, Transformers and of course, Lawrence of Arabia. 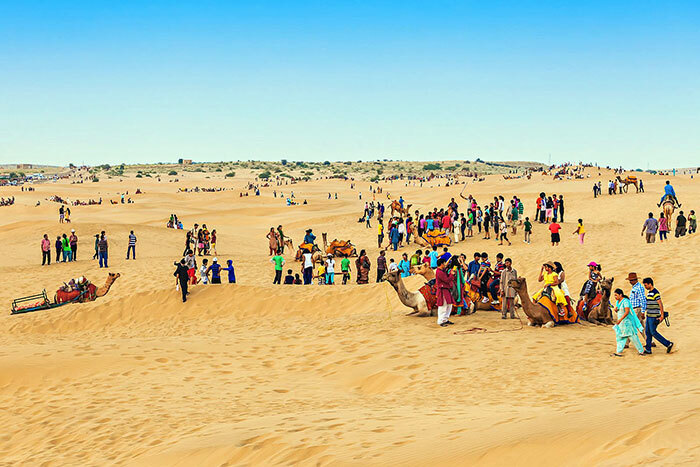 In this rather desolate and harsh climate, nomadic tribes like the Bedouins have lived for thousands of years, shepherding goats and camels for their livelihood and maintaining their indigenous culture and customs. 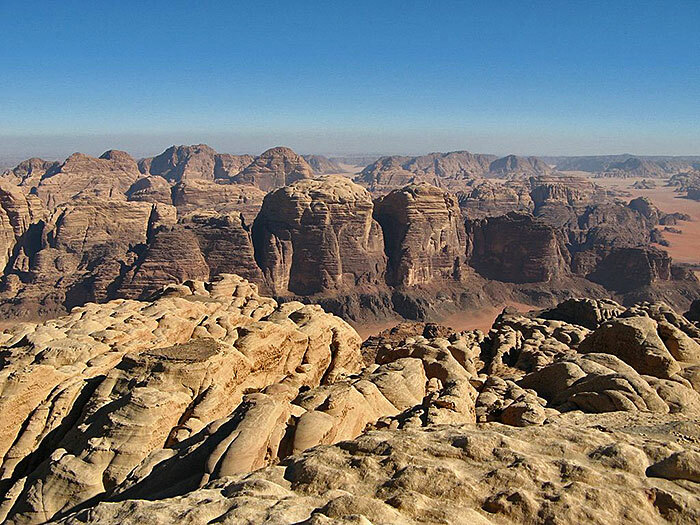 I had an opportunity to experience this nomadic life in southern Jordan, also known as the “Grand Canyon on the Middle East.” While there, I discovered a deep peace and tranquility within. I lived like the local desert dwellers, trading modern conveniences for sleeping under an illuminated sky. Secluded from the world, I became more aware of my own senses and came away with a renewed concept of self, calm and inspiration. During my sojourn in Jordan, I experienced the Rahayeb Desert Camp, voted Desert Camp of the Year 2018 by Travel & Hospitality. I camped out under a massive rock, where I took in the solitude of the desert air. If you’re wondering what the desert has to offer, it’s the quiet that gets you. Surrounded by the boundless landscape, you can feel your heart beating and listen to the sounds of your own breath. 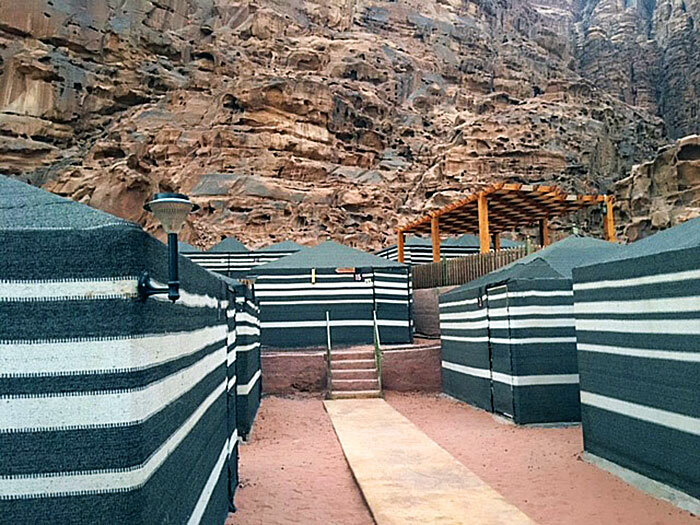 The Rahayeb Desert Camp offers several types of accommodations that range from deluxe tents, mini-suites with private bathrooms, to more basic accommodations with a standard tent. This city girl found that the deluxe tent provided everything I needed for a restful night’s sleep. Dining is done in a communal setting, where ancient music is gently played and feasting on traditional Zarb barbecue is worth the wait. Long ago, chicken, lamb or goat were placed in earthen ovens and wrapped in palm leaves to cook. 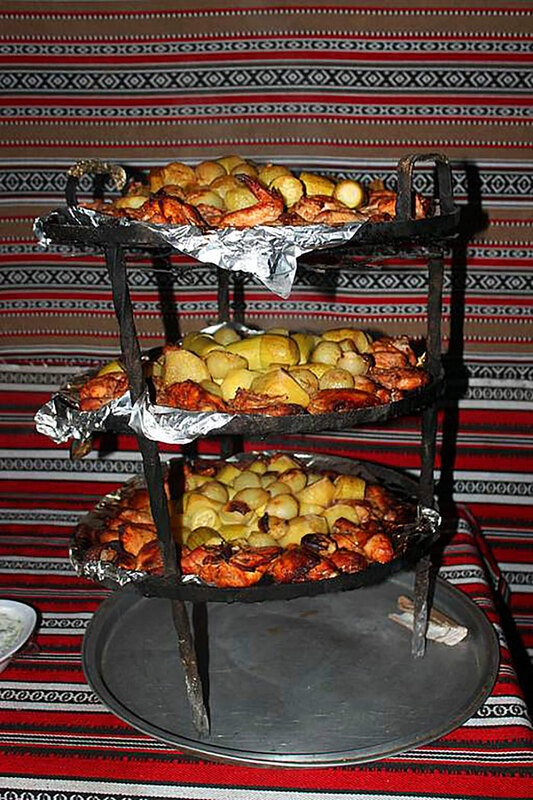 I watched as Bedouins wrapped the chicken and vegetables in a metal oven, covered it in foil and lowered it in the ground. Then, they covered it with a blanket and sand, to keep the heat from escaping. Two hours later, voila, dinner was ready, but I already knew that from the wonderful smoky aromas that wafted in the air. Slowly, the Zarb barbecue came rising up from the ground like a Phoenix, delicious and piping hot. I dined with my companions on roasted lamb, savory rice, Tahini salad, olives, hummus and crispy Jordanian bread. For dessert, baklava and sweet cake topped off this delicious meal. After dinner, I sat in front of an open fire pit with my new friends and gazed into the starry night sky, as I sipped a soothing mint tea. 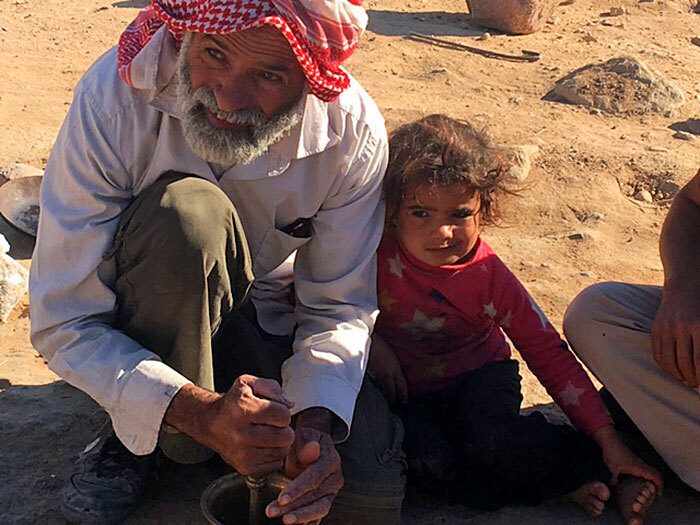 In the morning, I visited with a Bedouin family to learn about their daily lives. I helped them bake bread and learned how to make Arabic coffee. 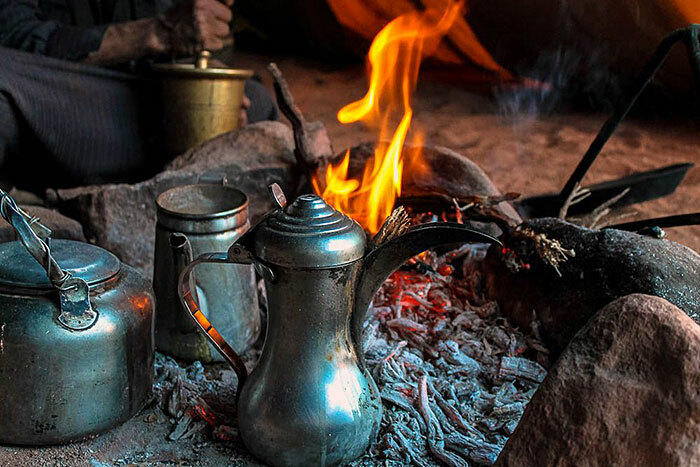 The Bedouins add cardamom spice to their coffee, which creates a unique taste. I roasted the coffee beans, ground them up, and brought the coffee to a boil. Upon hearing the tap-tap-tap on the coffee pot, I knew it was done and the family was ready to welcome visitors. In return for my efforts, the Bedouin women applied the ancient Kohl black liner to my eyes, which made me feel so mysterious. At last, my chariot was calling. I jumped onto the back of a 4 x 4 open-air jeep for a ride through the Wadi Rum desert. Feeling the wind in my hair, the jeep bounced as it went up and over the mounds of pink sand. We stopped in front of the Seven Pillars of Wisdom, carved out of a mountain, and I stood there in awe of this natural wonder. Then we climbed the sand dunes and I was rewarded with exquisite views as far as I could see. We ended amid a mesmerizing sunset with paper lit lanterns creating a magical spell over the entire terrain. 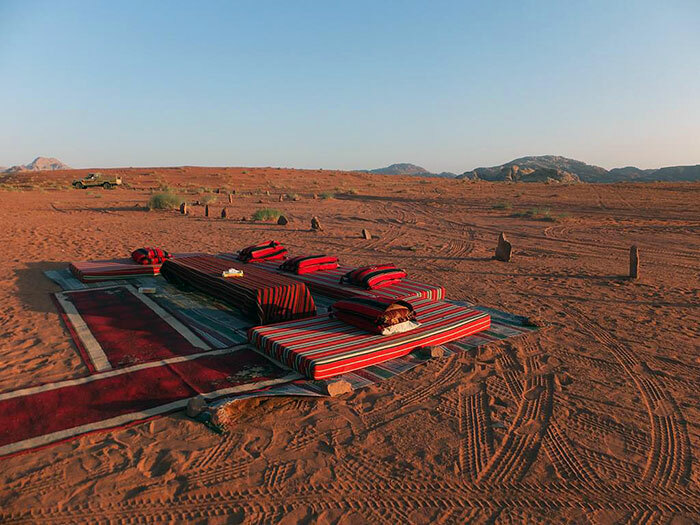 For those truly adventurous souls, the Rahayeb camp also offers a sunrise camel safari, rappelling, star gazing or “Eat, Pray, Love” meditation. You can also see the magnitude of this desert paradise from the perspective of a hot air balloon, 4,000 feet above the ground. At other desert camps, you can shadow a shepherd for a day and take the flocks up high in the mountains at the break of dawn. As you tend to the flock, you’ll hear the bleating of the sheep and learn how they move with the clanging of the bells. Together, these sounds create “a symphony of the hills” that will stay with you forever. All too soon, it was time to return to my reality, but I had changed. 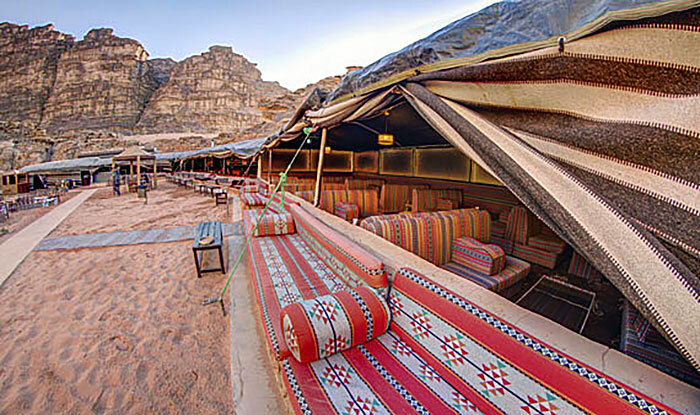 My life became infinitely enriched by my Jordanian Bedouin experience. From the magnificent landscape to the nightly star shows, to abounding adventure, the Wadi Rum desert showed me a spectacular world worth exploring. Experience it for yourself. Mira Temkin’s thirst for adventure keeps her ready to go with her bags packed. You can read her global reports at www.myjordanjourney.com. Photos © Mira Temkin, Visit Jordan, Rahayeb Desert Camp, Bookings.com, Ester Inbar, Berthold Werner, Jordan Ecotour.